To view the very first EAI Carbon Tax Profile, click HERE. This year, a coalition of Carbon Tax advocates has been pushing a Carbon Tax scheme dubbed The ESSEX Plan. What the ESSEX Carbon Tax would do is place an excise tax on fossil fuels (topping out at 32¢/gal. for gasoline, 40¢/gal. for home heating oil and diesel, and 24¢/gal. for propane and natural gas), and, after accounting for administrative costs, grant the revenue to electric utilities for the purposes of lowering electric rates. Back in April, The Ethan Allen Institute commissioned a big-picture analysis of what this would mean for our state and our economy. Now we are diving into what this could mean for individuals and household budgets. Over the next several weeks, EAI will be releasing several profiles that reveal what Vermont households could end up paying if the ESSEX carbon tax becomes law. These profiles will feature a variety of households with various incomes, household sizes, age-ranges and locations within Vermont. To create these profiles, EAI surveyed over over 60 Vermont households about their fossil fuels needs for heating and transportation. Some of the profiles will reflect one actual household, others will reflect composite data from similar households. Our goal is to give Vermonters the chance to compare their own households to households with similar characteristics, so that citizens can get an idea of what they would pay under the ESSEX Carbon Tax. All profiles use a pseudonym and stock photos to protect the identity and privacy of our respondents. Click HERE if you want to view our first profile, or read on if you would like a detailed explanation for how we obtained each line in Bob’s profile. % of Income Lost to Carbon Tax in 2026: we took the household’s 2017 income (SECTION 1) and divided it into the Net Carbon Tax (2026) below. Net Impact in 2026: The ESSEX Carbon Tax calls for increasing the tax steadily every year from 2019 to 2026, at which point the tax rate on fossil fuels in 2026 will be 8 times as much as the tax rate on fossil fuels in 2019. While the 2019 tax might put a little pressure on the households of Vermonters, the 2026 fully implemented tax could very well be the difference between a family staying in Vermont and a family that packs up and moves to any of the other 49 states that don’t have a carbon tax. In 2027, and in each successive year, the tax increase is tied to inflation (CPI). Budget for purchasing energy-efficient heating or electric vehicle: with the exception of a few households, the vast majority of households surveyed answered “no” when asked if they were able to purchase more energy-efficient heating or an electric vehicle to offset the household increase in gasoline and heating fuel. Households might be able to improve their lot by purchasing expensive, state-of-the-art heating systems or electric cars, but these represent substantial investments that most households simply we surveyed cannot afford. 2019 Gasoline Tax:per gallon gasoline 2019 tax multiplied by annual consumption of gasoline. If a household used diesel gasoline at the 40% higher tax rate, this is included here. 2026 Gasoline Tax:per gallon gasoline 2026 tax multiplied by annual consumption of gasoline. If a household used diesel gasoline at the 40% higher tax rate, this is included here. Tax per Gal. Gasoline: (2019: $0.04 / 2026: $0.32) : this is the amount quoted in the ESSEX proposal to the legislature, released in November 2017. The ESSEX Carbon Tax taxes each gallon of non-diesel gasoline 4 cents in 2019, before reaching 40 cents/gallon in 2026. Diesel per: (Month: # / Year: #) (2019: $0.05 / 2026: $0.40): Diesel is taxed higher 20% higher in all years than non-diesel gasoline. of Propane per (Month: # / Year: #) All survey households provided this information directly. Survey respondents were asked reference their heating bills to provide the number of gallons of propane that their household consumed, if propane was their household’s primary source of heat. Tax Per Gallon of Propane (2019 / 2026) ($0.03 / $0.24): The ESSEX Carbon Tax taxes each gallon of non-diesel gasoline 3 cents in 2019, before reaching 24 cents/gallon in 2026. Heating Oil per: (Month: # / Year: #) All survey households provided this information directly. Survey respondents were asked reference their heating bills to provide the number of gallons of heating oil that their household consumed, if heating oil was their household’s primary source of heat. Tax Per Gallon of Heating Oil (2019 / 2026) ($0.05 / $0.40):Home Heating Oil, is taxed the most heavily of any fossil fuel under ESSEX, eventually reaching $0.40 cents per gallon in 2026, which would be an increase of about 20% compared to current prices for a gallon of heating oil. Homes heated with heating oil will be the most heavily penalized of all homes that heat using fossil fuels. Assuming two heating systems of equal efficiency, it takes roughly the same volume of heating oil as propane to heat a home. However, the tax on heating oil is 40% higher by volume than propane. CCF Natural Gas per: (Month: # / Year: #) All survey households provided this information directly. Survey respondents were asked reference their heating bills to provide the number of CCF of natural gas that their household consumed, if natural gas was their household’s primary source of heat. Tax Per CCF of Natural Gas (2019 / 2026) ($0.03 / $0.24): A CCF of natural gas goes much further than a gallon of propane to heat a home for a Vermont winter. Yet the tax on a per unit basis is the same. Therefore, homes using propane (as are many homes outside Chittenden County), will be more heavily penalized (but as penalized as homes that heat with heating oil), while homes using natural gas will be penalized to a lesser extent. Rebates: We are skeptical that the ESSEX Carbon Tax would be “pretty easy to administer” as its advocates have claimed, especially given Vermont’s past mishaps with statewide government programs, along with the high degree of complexity needed to administer ESSEX efficiently. We used the 2017 World Bank’s CARBON TAX GUIDE: A Handbook for Policy Makers to estimate the “Marginal Cost of Public Funds” (MCPF) for ESSEX. In other words, the fraction of every dollar of taxes necessary to administer ESSEX. To our knowledge, ESSEX advocates have never discussed the administrative cost of ESSEX beyond vague generalities. Using the MCPF, we determined that about 37% of carbon taxes collected from household will be needed to pay government workers to administer and audit the program, which means that Vermonters would see 63% of the household level taxes collected return to them in the form of rebates. However, there will be substantial differences in each household’s “Net Impact,” from ESSEX rebates. Homes with low incomes, high electricity usage, and/or a rural location will all pay less taxes than homes without these attributes. While it is hypothetically possible to break even with ESSEX, the results of our survey suggest that the vast majority of households will be worse off, some dramatically so if they rely on fossil fuels heavily and have limited eligibility for rebates. 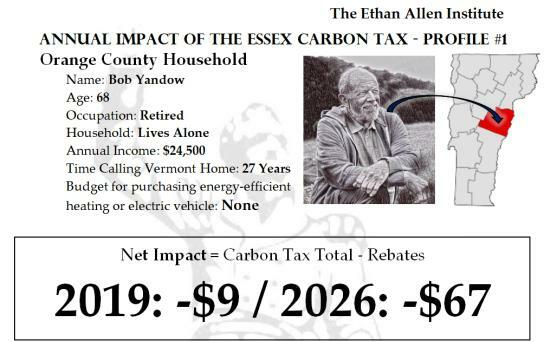 Rebate 1, “Low-Income” for 2019:This rebate would soften the blow of the carbon tax on the poor, but would not entirely make the poor immune from the ESSEX Carbon Tax. This rebate creates 4 categories of households, 3 of which would receive rebates while the fourth would not. This calculation uses 2017 poverty levels from the US government’s Assistant Secretary of Health and Human Services for Planning and Evaluation (ASPE), which uses household size and income levels to determine the % of poverty level. The ESSEX Carbon Tax denotes that Vermont households at 0-99% of poverty level would receive the maximum rebate. 100-199% would receive 75% of the lowest income households, and the 200-299% group would receive 50% of the lowest income households. Those with an income at 300% or above would not receive any Low-Income Rebate. Rebate 2, “Electricity” for 2019: The ESSEX Plan proposal came with a sample bill that shows what rate per kWh a Vermont household could hope to earn back on their fossil fuel taxes. This bill includes the rebate, presumably from 2026, showing a Vermont household receiving $0.0276/kWh. Divide that rate by 8 (for 8 years), and the 2019 rebate rate would be $0.00345/kWh. Households that use more electricity would receive a much larger rebate by 2026. Rebate 3, “Rural” for 2019:According to this rebate, households fit into two categories- those are considered “rural” and would qualify for the rebate, and those that are considered “non-rural”(urban) and would not. This determination is made at the Census Block level, using data from the American Community Survey. For the most part, a household within Chittenden County would be ineligible for the Rural Rebate, while most (but not all) households outside Chittenden County would qualify for this rebate. Earn Back on 3 Rebates in 2019: A household’s Electricity, Low-Income and Rural rebates are added together in this step. Earn Back on 3 Rebates in 2026: The number in the previous line is multiplied by 8, indicating that a household in the same location which consumes the same amount of electricity in 2026 with minimal income changes would receive 8 times their 2019 rebate. Previous post: Vermont Off Track for Greenhouse Gas Goal! So what?